A medium-duty workhorse, our classic PEVA body bag comes in two sizes, 40"x96" & 31"x49". PEVA cadaver bags from Classic Plastics are made using our custom formulated poly plastic that is both soft and durable. 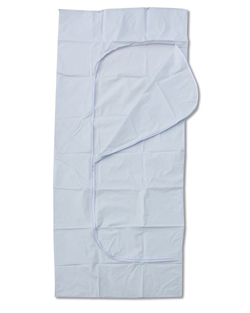 Our PEVA body bag has no PVC so it is burnable per EPA standards. Classic Plastic's PEVA body bag has the popular envelope-style zipper construction, 3 identity tags, and leak/puncture resistant fabrication. Primary Application: Crematoriums primarily use our PEVA mortuary bags because they are chlorine free and burnable. These bags are also sometimes used by customers such as coroners, medical examiners, and medical transport companies.